We’re all still learning this “social media marketing” stuff. There are thousand of blogs, books, articles, etc. that tell you how to do it. They all explain the free marketing benefits of using social sites like Facebook and Twitter to promote your business, but sometimes they leave out the etiquette. Sometimes it is not even etiquette, just common sense. Someone has a personal profile on Facebook. She has quite a few friends, so she decides to transition it to be their “vanity” profile. Her profile has the pictures of the family, likes, etc. and a blurb about how successful she was at turning her business idea into a cash machine. Now she does seminars and webinars to tell you how you can be just like her (for only $99!). No problem, she’s a friend — well a Facebook friend you met through a networking group or something. Then, one day she gets the social media marketing bug and decides to start promoting herself A LOT. She posts links to her website several times a day. They start stacking in your news feed because she sends them through Twitter, her fan page and other feeds. She sends messages to your Facebook inbox. She invites you to events (her seminars). She SPAMS you. So, what do we do? We unfriend her, hide her from our feed (love that Facebook option), or block her. One day when I *do* want to learn secrets of making a cash machine, I won’t be able to find her. Is this really what she wanted? You’ve heard it before, but thought I’d say it again anyway: Think about what your “friends” are seeing from you. Offer tips, great links, insights. But, sell softly. 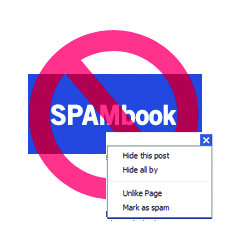 If any of your friends turn into spammers, you may want to kindly tell them. And, don’t be afraid to use that Hide button.